The new joint venture is designed to build on PepsiCo’s strong existing position in Thailand and to create new growth opportunities for both companies in the market. PepsiCo is one of the leading players in Thailand’s growing liquid refreshment beverage market, and the alliance is intended to combine the strengths of both companies in ways that are mutually beneficial to their businesses, customers and consumers. The joint venture also positions PepsiCo to continue to transform and expand its beverage portfolio to meet consumer demand for healthier options, and incorporate Suntory’s complementary brands and broad offerings. 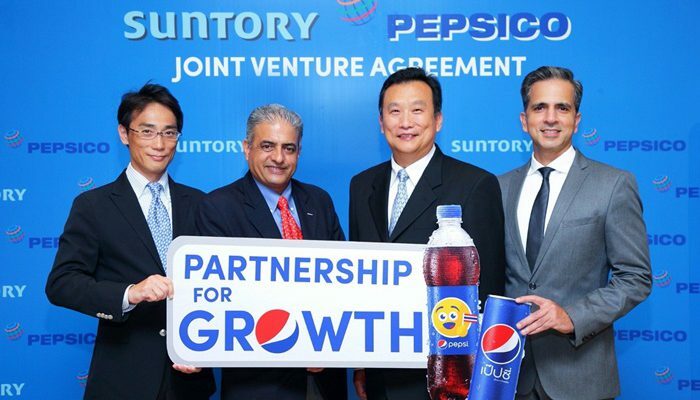 Under the terms of the joint venture agreement, PepsiCo’s Thailand beverage business, operated through the company International Refreshment (Thailand) Co. Ltd (IRTC), will change its name to Suntory PepsiCo Beverage (Thailand) Co., Ltd. Suntory will become a 51 percent shareholder, while PepsiCo will retain 49 percent of this formidable new alliance. Suntory and PepsiCo leaders will hold key roles in the management of the joint venture, which will serve as the bottler for both companies in Thailand. Suntory and PepsiCo have an established record of successfully working together in other markets, including the United States, Japan, Vietnam and New Zealand. Suntory has accelerated its global strategy and expanded its beverage and food business in Asia Pacific following the establishment of its regional headquarters in Singapore. Expansion into the beverage business in Thailand is a key part of Suntory’s long-range plans. Suntory is also the owner of BRAND’S® in Thailand, which is one of the largest health supplements manufacturers and marketers locally and in the region. Additionally, Suntory has a strong portfolio of beverage brands including Lucozade®, Ribena®, CC Lemon®, TEA+®, MYTEA®, GoodMood® and MYCAFE®. In the last five years – 2012 through 2016 — PepsiCo has invested hundreds of millions of US dollars in Thailand through its beverages and foods businesses, including two beverages and two foods manufacturing plants. PepsiCo invested in its first beverage plant in Thailand, located in Amata City Industrial Estate of Rayong Province in 2012. In 2016, it opened a second beverage plant in Thailand, located in Nong Khae Industrial Estate, Saraburi Province, with an aim to strengthen its growing beverage business in Thailand and support long-term portfolio expansion and diversification, doubling capacity of its first plant. PepsiCo will retain marketing and innovation responsibilities for PepsiCo’s iconic beverage portfolio, so Thai consumers will still be able to enjoy their favorites — including Pepsi-Cola, 7-UP, Mirinda, Gatorade, Lipton, and Aquafina. PepsiCo will continue to independently operate its foods business in Thailand. PepsiCo enjoys market leadership in Thailand’s snacks category with its Lay’s, Sunbites, and Tawan brands, and intends to maintain support for the local agriculture industry, and to invest in innovation and distribution to grow its foods business across the country. This transaction is subject to the completion of legal processes.